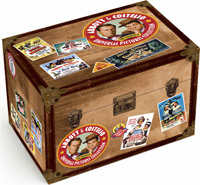 Get ready to laugh out loud with the most popular comedy duo of all time in Abbott and Costello: The Complete Universal Pictures Collection! Now, for the first time ever, all 28 films produced during the height of their popularity at Universal Pictures are now available in one collection. Featuring their most popular movies such as Buck Privates, Who Done It? and Abbott and Costello Meet Frankenstein, this collection is filled with some of the most hilarious routines of all-time including “Who’s on First?” Loaded with hours of bonus features and an exclusive collectible book, this is the ultimate tribute to two of the funniest, and most enduring, comedians of all time!